Jimmy Justice probably did not realise his full potential because of a lack of original material and poor decision making. However, he had one of the richest sounding voices in the UK during the early 1960s- even if it failed to make him one of the richest singers. In fact, if you hadn't ever seen or heard of Jimmy Justice before, then his early recordings sounded more like those of an established black American than a young white Londoner. This illusion was reinforced by the choice of material used for his record releases which were mostly remakes and covers of songs taken from US groups. 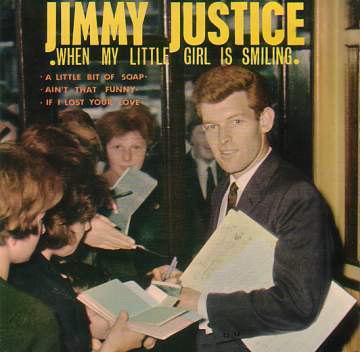 Jimmy Justice had only this EP released in the UK during his 1960s recording career. It bears the Pye catalogue number NEP24159 and the tracks on it were simply taken from his most successful singles. It's now probably easier (and cheaper!) to find these songs on the original singles. Jim Little had struck up a chance friendship with two of the Checkmates, Dave and George Sweetman- Emile Ford's step-brothers, no less. The fact that he could sing soon came to the attention of Emile who encouraged Jimmy to form his own group and join the coffee bar circuit. Emile also suggested entering the same talent competetion that he had himself previously won. This led, as it had done for Emile, to an opportunity to record with the Pye record company and with Emile's help on production his first single "I Understand Just How You Feel" was released. This was credited to 'Jimmy Justice and Jury' although the backing musicians were really the Checkmates. Pye tried again with more singles and the pop wizard, Tony Hatch, was brought in to do the production. Jimmy's third release didn't quite reach the charts but did sell well and it's surprisingly easy to find a copy. This song was a cover of the Jarmels' "Little Bit Of Soap" and could be viewed now as a template for what was to come. Hatch chose the Drifters' "When My Little Girl Is Smiling" next- which on the face of it was a hopeless cause- being up against not only the original, but also another well made cover from the established British star, Craig Douglas. Nevertheless, the Justice version managed to share the honours of a #9 chart entry with the more experienced Craig. The next release produced Jimmy's biggest UK success, "Ain't That Funny". It was a song that had been written by Les Vandyke and Justice was presumably lucky that the song had come to him rather than Eden Kane with whom the songwriter was closely associated at the time. After this splendid original, it was back to the US group catalogue with "Spanish Harlem", which turned out to be Jimmy's final UK chart entry. Sadly, the choice of Jimmy's following material was really not good enough for the competitive UK market. He had a little more luck on continental Europe and in Scandinavia, where the B-sides of some of his releases proved popular- and probably should have previously been released at home as the A-sides. As a result of his disappointment in the UK, Jimmy spent the following years in Sweden and his promising beginnings in the UK were allowed to fade away. Pye NEP24159 1962 "When My Little Girl Is Smiling"